1685 John Inian established ferry service between New Brunswick and Highland Park. 1700s A tavern and inn located near the ferry landing operates for many years. 1776-1777 For seven months, thousands of Hessian and British troops occupy much of the land that would become Highland Park. 1795 First toll bridge was constructed, replacing the ferry. 1806 Essex-Middlesex Turnpike built from Metuchen to Highland Park. 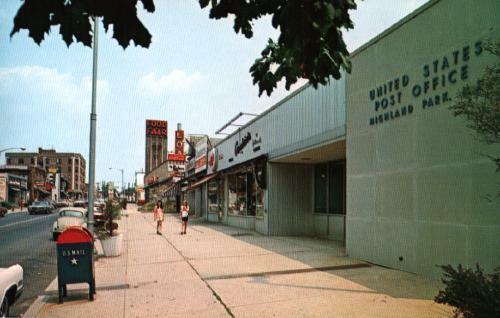 Now Raritan Avenue and Route 27 (Lincoln Highway) from Sixth Avenue to Metuchen. 1809 Newly appointed president of Queen's College, John Henry Livingston purchases 150-acre tract that will become known as the Livingston Manor. 1835 Tornado causes significant damage to area houses, barns, and fields. 1836 New Jersey Railroad and Transportation Company built a rail line that terminated on the Highland Park side of the Raritan River. Now it is Amtrak's Northeast corridor line. 1838 Camden and Amboy Railroad built wooden railroad bridge across the Raritan. 1843 Livingston Homestead constructed on 150 acre property as summer house for New Yorkers Robert & Louisa Livingston, relatives of John Henry Livingston. 1853-55 William Flagg builds three mansions overlooking the Raritan River in "Raritan Park." He names the new south side street Adelaide Avenue. 1867 Brewery was established in the hollow west of North Second Avenue. It burns down in 1912 except for one building. The remaining bottling building on Montgomery Street is converted into apartments. 1870 Highland Park annexed into the newly formed Raritan Township from Piscataway Township. 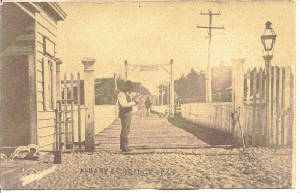 1875 The Albany Street Bridge is purchased by Middlesex County and the toll booth is eliminated. 1878 Wooden railroad bridge destroyed by fire. Replaced with iron truss bridge. 1883 Christopher Meyer buys one of William Flagg's houses on Adelaide Avenue. Along with his descendents, the Rice family, the house becomes known as the Meyer-Rice house. It would become the Jewish Community Center in 1956 and the "Y" in 1961. 1886 First schoolhouse opened at Benner Street and South Second Avenue. Chrissie Bartle is first teacher. The school was designed by architect George K. Parsell. 1889 Kitchenmeister's florist business began in "Floral Valley" at the end of North Fifth Avenue. 1889 First grocery store was constructed on Raritan Avenue. 1890 Johnson & Johnson constructed several small laboratory and storage buildings near North Adelaide Avenue. The last of them burns down in 1915. 1890 Reformed Church congregation was established. 1890 Robert Wood Johnson, Sr. buys the large estate on River Road just north of the railroad tracks. It is used as a farm for Johnson & Johnson and upon his death in 1910, as a summer house for his son, Robert Wood Johnson Jr.
1892 Stone arch Albany Street Bridge constructed. 1895 First gas street lights were installed along Raritan Avenue. 1897 Trolley service to Perth Amboy along Raritan and Woodbridge Avenues began. Another line to Bound Brook along River Road was established. 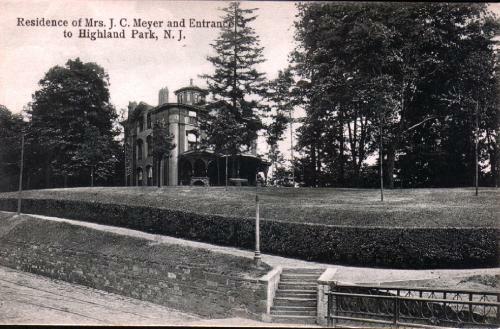 1897 Highland Park Hotel was constructed at Woodbridge and Raritan Avenues. Operates as a hotel until the 1950s. 1897 John Waldron machine factory is constructed off Cleveland Avenue near River Road and the railroad tracks. 1898 Race track opened on Woodbridge Avenue at Duclos Lane. Having both horse races and bicycle races, it operates until 1906. 1898 Reformed Church was constructed on South Second Avenue. This is Alexander Merchant's first design as an independent architect. 1899 Electric street lamps were erected along Raritan Avenue. 1900 Baptist Church constructed on Raritan Avenue at North Second Ave.
1901 Firehouse was constructed at Raritan and North Second Avenues. Designed by George K. Parsell. Stone arch railroad bridge built in 1903. 1903 Stone arch railway bridge constructed by Pennsylvania Railroad. Replaces the iron truss bridge. 1905 The Borough of Highland Park was established by State Legislature on March 15th. James B. Archer elected first mayor. 1906 Watson Whittlesey's Livingston Manor housing development began on the north side. 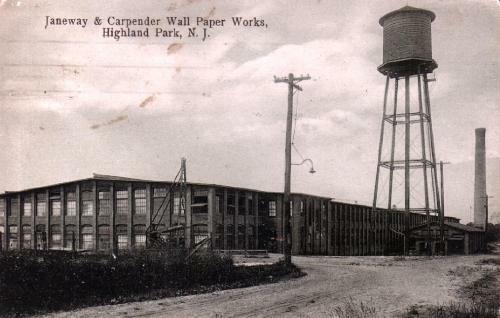 1907 Janeway & Carpender Wallpaper factory relocated to Highland Park along Cleveland Avenue and the railroad tracks. 1907 Highland Park School is built on South Second Avenue at Benner Street. Designed by Alexander Merchant. 1909 First drugstore opened on Raritan Avenue at Cedar Avenue. It is a branch of Lewis Hoagland's New Brunswick drugstore. 1909 Alexander Merchant builds a house for himself and his family on South Adelaide Avenue. Neighboring houses, including several on Cliff Court are also built based on his designs in the years that follow. 1910 The Airdome (an open air theater) was built on River Road. It closed in 1914. 1910 First aeroplane to fly over the town. Charles K. Hamilton, pilot. 1910 Drug store owner Lewis Hoagland creates a set of twenty postcards of Highland Park's sites including the firehouse, Adelaide Avenue, Janeway & Carpender Wallpaper factory, and Public School. 1914 Raritan Avenue became part of the transcontinental Lincoln Highway. 1915 Two neighborhood schools are constructed Irving & Hamilton from the same architectural plans by Alexander Merchant. 1914 St. Paul's Church constructed on Raritan Avenue at South Sixth Ave. William Boylan is the architect. 1917 Druggist Joseph Barlow opens his own pharmacy at 128 Raritan Avenue. 1919 Greek Orthodox Church constructed on River Road. Designed by architect William Boylan. 1920 Rice Memorial School for Colored Children opened. It closed in 1924. 1920 Robert Wood Johnson, Jr. became mayor. 1920 Forest Park amusement park was established on Karsey Street. It closed in 1924. 1920 The Band-Aid was invented by Earle E. Dickson. He resided at 326 Montgomery St.
1920 First apartment building on Raritan Avenue was constructed at the corner of South Third Ave.
1920 New car showrooms are located at 114, 127, and 426 Raritan Avenue. 1921 Flako Products' packaged baked good mixes created. 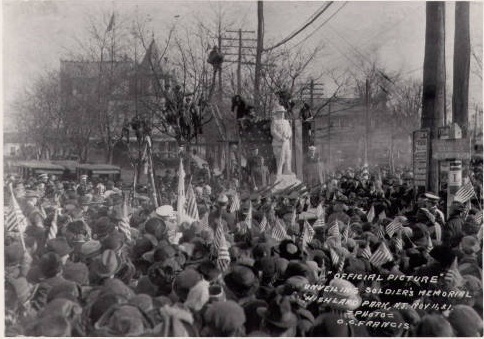 1921 WWI Doughboy memorial monument erected at Woodbridge and Raritan Avenues. 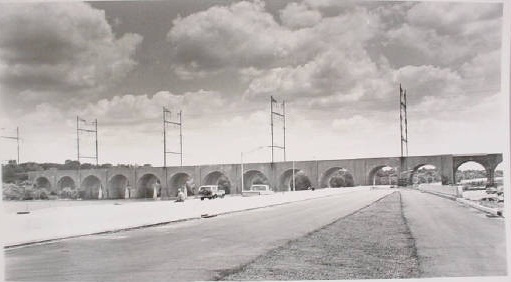 1922 Ayres Beach opens on the curve of the Raritan River below the Albany Street Bridge. 1923 Masonic Hall constructed at Raritan and North Fourth Avenues. 1925 Alexander Merchant designed the new Police Department building and jail at 137 Raritan Avenue. It is now a deli. 1926 Highland Park Junior High School is constructed. 1926 Movie theater opened on Woodbridge Avenue at South Sixth Avenue. It closed by 1960. 1926 J. Seward Johnson builds Merriwold estate on River Road for his first family. 1927 All Saint's Episcopal Church constructed on Magnolia Street and South Third Avenue. 1927 St. Paul's Parochial School on Raritan Avenue opens. Designed by George W. Brooks, it operated for sixty-five years as a school. 1928 Trinity Methodist Church on Montgomery Street constructed. Designed by Phildelphian architect George Savage. 1930 Conservative Temple built on North Third Avenue. 1932 Third Avenue Sweet Shop opens on the corner of Raritan and South Third Avenues. Today's Corner Confectionery, It is the longest continuously run sweet shop in Highland Park. 1933 Dance marathons took place at the Masonic Hall. 1933 Chrissie Bartle was the first woman to run for Borough council. She did not win. 1930s Trolley lines shut down. Last trolley goes through town in 1936. Buses and private automobiles continue to rise in popularity. 1937 Sally Tischler opened a tavern on the corner of Raritan and North Third Avenues. 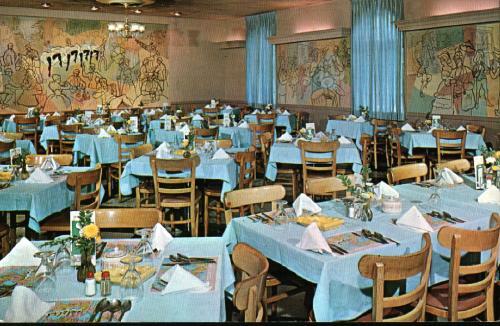 It would later be enlarged to become Sally's Steakhouse in the 1950s. 1943 Memorial honoring World War II soldiers erected on South Fourth Avenue. 1946 Donaldson Park, a Middlesex County park, was created. 1949 Redcliffe Garden apartments complex was constructed on South Adelaide Avenue. 1949 Conservative Temple congregation builds larger synagogue on South Third Avenue. 1950 Robert Wood Johnson gives his estate on River Road to the Sisters of the Cenacle. It opens as a religious retreat house and operates as one for fifty-five years. 1951 Montgomery Street Apartments complex is constructed. 1952 Highland Park resident Selman Waksman wins Nobel Prize for his role in developing the antibiotic streptomycin. 1953 First Park Town Outing was held in Donaldson Park. 1955 Highland Park celebrates its 50th anniversary jubilee. 1955 Highland Park opens its new fire station on South Fifth Avenue. The old firehouse on Raritan Avenue is converted into a dry cleaners. 1956 Meyer-Rice mansion on South Adelaide Ave. converted into the Jewish Community Center. George Segal teaches art lessons. 1958 High School receives an addition known as the "English" wing. 1958 Two volunteer firemen are killed at Ten Broeck Motors fire on Woodbridge Avenue. 1959 Highland Park Public Library is constructed on North Sixth Avenue. 1960 Roy Lichtenstein, a design professor at Rutgers, moves to South Adelaide Avenue in Highland Park. 1960 John F. Kennedy's campaign trail proceeds through Highland Park. 1961 The movie theater on Woodbridge Avenue and South Sixth Avenue is demolished. 1961 Masonic Lodge #241 constructs addition on the front of the old Temple on North Third Avenue. 1961 The Jewish Community Center expands by adding a large athletic facility designed by Ernest Levine to their Victorian mansion on South Adelaide Avenue. It becomes the YW-YMHA. 1962 Post Office in its own building on Raritan Avenue opens. 1962 Congregation Etz Ahaim constructs their synagogue on Denison Avenue. 1963 The Greek Orthodox Church relocates to Piscataway and their church on River Road becomes the church of a Russian Orthodox congregation. 1965 Fire at Masonic Temple destroys the auditorium and offices of the upper stories. First floor remains as the commercial building at the corner of North Fourth and Raritan Avenues. 1967 Middle School is built on South Fifth Avenue and Mansfield Street. Named Bartle School to honor Highland Park's first school teacher, Chrissie Bartle. 1968 The High School expands with the addition of the Science wing. 1970s Cedar Lane receives over 350 housing units in several garden apartment complexes. 1970s The Highland Park Historical Commission is active. 1978 Highland Park resident Arno Penzias wins Nobel Prize for Physics. 1979 New Borough Hall is constructed on South Fifth Avenue. 1984 Charles Figg becomes the first African-American member elected to Borough Council. 1987 Popular Highland Park High School principal William Donohue is killed. 1987 A six-story, luxury apartment building is built on South Adelaide Avenue on land that was formerly part of the YW-YMHA lot and before that, the Meyer-Rice estate. 1989 Congregation Ahavas Achim builds a synagogue on South First Avenue. 1997 The Brody House at Raritan Avenue and North Adelaide Avenue is demolished. It was designed by Alexander Merchant and built in 1911. 1998 First woman mayor, Meryl Frank, elected. 1999 First history book, a pictorial by Jeanne Kolva and Joanne Pisciotta for the Highland Park Historic Society is published. 2002 The Livingston Homestead (Waldron House) is listed in the New Jersey and National Registers of Historic Places. 2003 Highland Park is selected to participate in the Main Street New Jersey program. 2004 The Livingston Manor Historic District is listed in the New Jersey and National Registers of Historic Places. Click on the Livingston Manor button for more information. 2005 Second book of Highland Park history written by Jeanne Kolva and Joanne Pisciotta is published. 2005 Highland Park celebrates its centennial one hundred years of notable history. 2005 The Sisters of the Cenacle Retreat House on River Road closes and is sold to a private owner. 2005 Highland Park's L.J. Smith catches a touchdown pass as a Philadelphia Eagles player at Super Bowl XXXIX. 2005 The Kaplan Organization adds a wing onto the "Castle," the former J. Seward Johnson estate on River Road. 2006 St. Paul's School on Raritan Avenue is demolished. 2006 A fire in the basement of the Conservative Temple on South Third Avenue renders the building unusable for a year. 2007 The Parker Nursing Home opens its assisted living facility "Parker at Stonegate" at the former J. Seward Johnson estate on River Road. 2007 "The Mirror" a newspaper with exclusive Highland Park coverage starts publication. 2007 The Eugene Young Environmental Center opens on River Road. 2007 The first temple and former Masonic Lodge on North Third Avenue is demolished. 2007 The YM-YWHA closes its Adelaide Avenue facility and relocates many of its operations to other venues. 2007-2008 The Reformed Church on South Second Avenue constructs a six-apartment addition to offer transitional housing for young adults previously in foster care.